Dixie Chopper Wheels: The solid front wheels on your Dixie Chopper zero turn help guide the machine as you mow your lawn and make those quick 180 degree turns. If one is broken or loose, your mower won't perform properly. 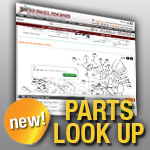 Find the replacement wheels you need for your Dixie Chopper mower below.